Apache TomEE supported in Jelastic PaaS is a Java EE server, which provides you with the best technology stack that can be deployed to a simple Java EE container. It's lightweight and at the same time is a full-blown application server, which remains simple and avoids architecture overhead. Today you'll see how easy it is to deploy Java web apps into TomEE. In the following tutorial you'll learn the basics of web application development with the help of the Apache Struts framework, which is an absolutely free open-source solution for creating Java web apps. 1. First of all log into the Jelastic dashboard and click the Create environment button. 2. Pick TomEE as your application server and specify the number of consumed cloudlets for it. 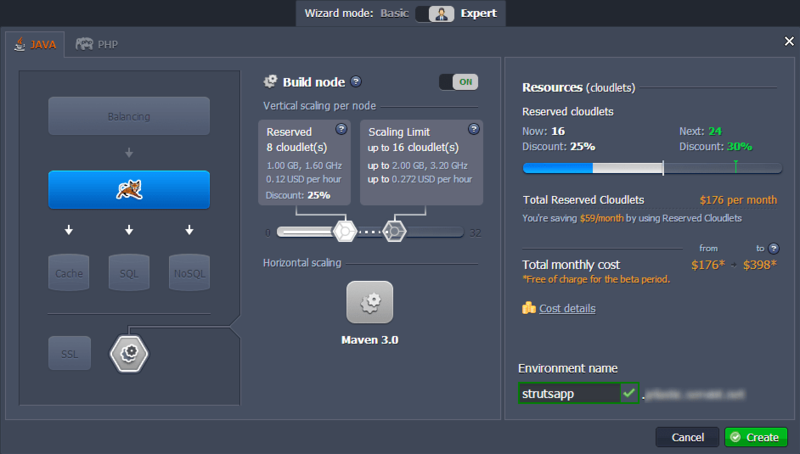 Then select the Maven node for further application building. Then enter your application name and click Create to confirm the creation of the new environment. Wait several seconds until your environment is created. As an example we'll use a TomEE sample application, developed with the Struts framework, which allows you to add users to the list and to find them in there.